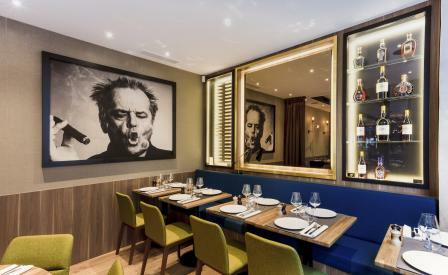 When hospitality veteran, Tony El Khoury - who once worked for some of the industry’s biggest restaurant, hotel and casino groups - found himself sitting next to a baseball cap-wearing Jack Nicholson at LA’s gambling tables one night, he told him, ‘when I open my first restaurant in Paris, I’ll put your portrait on the wall.’ True to his word, Nicholson’s charismatic face decorates one corner of El Khoury’s new Bistro de l’Arc, which located a few steps away from the Arc de Triomphe, is a triumph indeed. Designer Sophie Jacqmin’s slick interiors accurately express El Khoury’s larger-than-life personality from the standout brass Botti chandelier to the the ceiling integrating inspirational quotes from his heroes Winston Churchill, Marcel Proust and Kahlil Gibran, while framed tributes to celebrated New York club, Birdland reflect his love of jazz. The all-day menu is filled with easy-to-please classics from cheese burgers to crème brulée, but it’s the extensive wine cellar and the cigar humidor that will entice many to linger longer.